AACR membership includes scientists and physicians from across the cancer research enterprise. Whether basic, translational, or clinical researchers, they all share the same goal: to make progress for patients. In this post, Eric Rubin, MD, vice president and therapeutic area head, oncology early stage development, Merck Research Laboratories, and deputy editor of Clinical Cancer Research, one of the AACR’s eight journals, shares his thoughts on the AACR’s role in developing breakthrough cancer treatments. 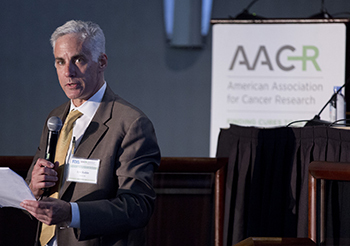 Eric Rubin, MD, speaks during a workshop on dose-finding of small molecule oncology drugs held by the FDA and the AACR last month. Photo by Alan Lessig. With advances in technology and clinical trial designs, anticancer drug development is increasingly translational in intent, and the lines between “phase I” and “phase II/III” clinical development have increasingly become blurred. The AACR is the oldest and largest scientific organization in the world focused on every aspect of high-quality, innovative, and translational cancer research. The AACR includes a broad representation of scientists studying all aspects of cancer, including etiology, biology, genetics, and treatment. Furthermore, with an increased focus on precision medicine, there is a need for constant interaction between bench and clinical scientists, which has been a longstanding goal of the AACR. Via journals, meetings, and other mechanisms, the AACR helps industry scientists who are involved in basic biology as well as clinical trials access cutting-edge information across the spectrum of translational science. Such rapid access to emerging information is important in efforts to get breakthrough treatments to patients as quickly as possible, and to fully realize the potential of such treatments. Furthermore, recently the AACR has been encouraging conversation regarding regulatory policy topics of interest, through workshops or focused sessions at the Annual Meeting. These have been quite valuable for industry scientists to gain perspective on issues such as companion diagnostic harmonization, use of next-generation sequencing in drug development, adaptive trial designs, and others. The AACR launched its newest journal, Cancer Immunology Research, in July 2013. The rapid development and approval of multiple new immunotherapies for the treatment of cancer is an excellent example of how collaborative efforts involving academia, industry, regulators, and organizations such as the AACR can facilitate information exchange that enables development of new therapies.